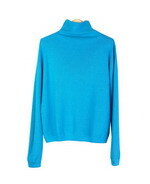 Silk/Cotton/Cashmere Sweater Long Sleeve in Relaxed Bateau-Jewel Neck Pullover Style. S to XL. 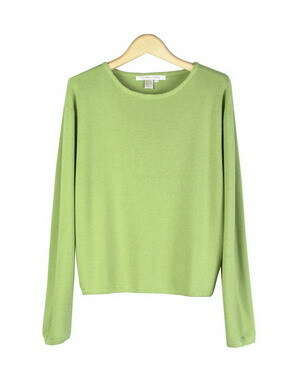 Silk/cotton/cashmere sweater pullover in relaxed bateau neck long sleeve style. It is a full sweater knit and look. 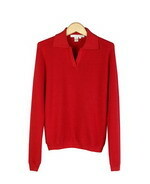 It is our customers' favorite high quality sporty sweater pullover. Soft-touch and easy-fit. It is a flattering shaped sweater. Available in 9 beautiful bright and pastel colors. Hand wash in cold water and lay flat to dry. Steam the sweater to achieve its original softness of good hand-feel texture. Silk/Cotton/Cashmere Sweater in Johnny Collar Long Sleeve Style. Full-Sweater Look. S to XL.